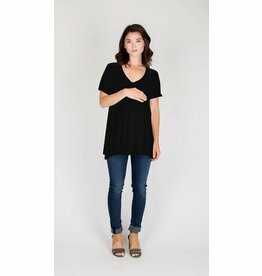 Nom Maternity's take on the classic tee. This seasonless basic is made with a silky soft bamboo fabric that will make it a forever favorite. Made from Nom Maternity's signature jersey blend, this throw-on-and-go seasonless staple is redefining the way you nurse in style. Made from Nom's super-soft jersey blend, this lean, bump-flattering basic that will make nursing simple. It's a just-add-shoes kind of look that will keep you cool all season long. It's a wrap, ladies! Your search for the perfect dress, that is. The perfectly draped bodice and full length sleeves make it oh-so flattering and nursing-friendly.